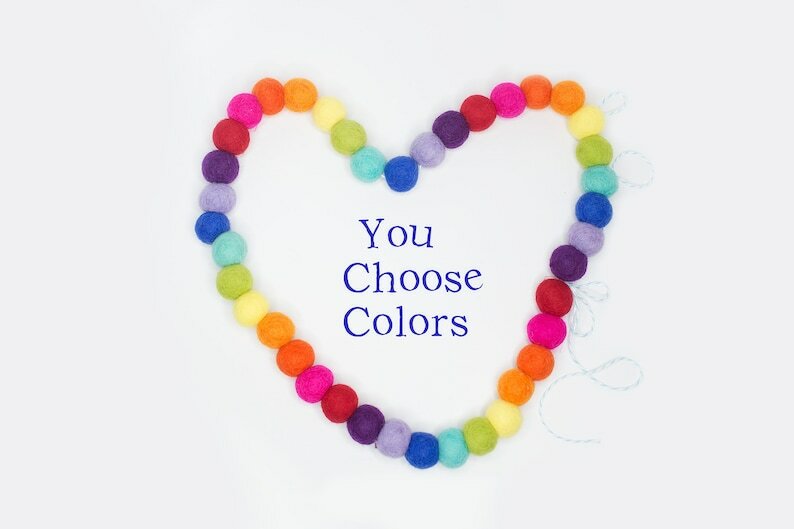 •Design: "You Choose" Customize by You! •Colorway: **Leave Color Choices/Pattern in "Notes to Seller" upon Checkout. •Pre-Strung Garland include: 6 ft-25 poms or 8 ft-50 poms w/coordinating baker's twine. **SOLID COLORS ONLY (Polka-dots & Swirls not included in this listing. They are available but are an additional charge). Only Pre-Strung Garlands come with baker's twine. If 'Loose' is chosen from the drop down menu, choose 'None-Loose Poms Only' when given a choice of Baker's Twine in the drop down menu. A 'Kit' including needle & baker's twine can be added for an additional $3.00 from the drop down menu. •50 felt poms placed back to back spans approximately 4 feet (the poms are strung on an 8 foot string and can move about the string to fit your desired space). Placed just one ball width apart, the garland can double in length, spanning 8 ft.
*The POM POMS can be spaced 2-3 inches apart or placed tight next to each other depending on your preference. They are strung up with floss, string, cord, twine or anything as thin as a double strand of sewing thread! Poms are generally strung without knots so you can gently tug and adjust the pom. They stay in place when strung. Loop and knot both the ends for easy hanging. 5 Poms side by side will make a lovely Cake Topper Garland! 25 Poms side by side will result in a 2 ft garland. 50 Poms side by side will result in a 4 ft garland. 100 Poms side by side will result in a 7 ft garland. *Please note that only the poms are included in this listing. (Photos may be taken with props.) Please keep the poms and garlands out of the reach of small children. Fast shipping and excellent quality! Just beautiful!